Another trip to the garden to pick tomatoes, and another full bag of 1x6s. We've done so many things with 1x6s this year, and I had time to peel and seed them the other night, so I made a simple sauce with garlic, onion, anise seed and bay leaf. I cooked it a long time and when it was thick I turned the burner off and let it cool down. Then I put it into freezer bags and now we've got another half dozen bags of sauce in the freezer, ready to be used on a busy Tuesday night in December when we're running around doing a few things too many. 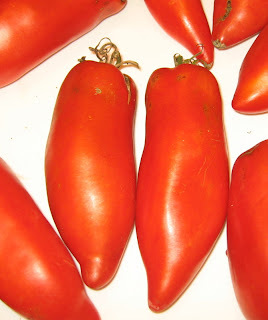 Made into sauce, 1x6 tomatoes have a noticeable orange hue to them, rich and deep.